I liked going west some mornings turning onto the Ipswich-Boonah road. 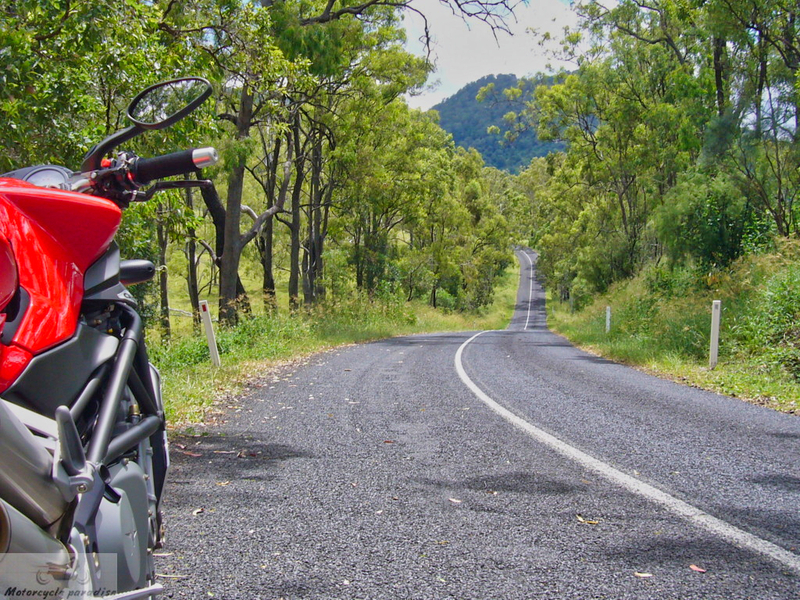 Take this out to Peak Crossing then turn right onto Kalbar-Peak Crossing-Munbilla road for some great views of the scenic rim in the morning sun. After this Lake Moogerah road and my tip before the lake take the Charlwood road west for the short ride to Aratula and get fuel and coffee there. Return to the lake and continue on to Mt Alford, here I like Ganthorpe road to the Rathdowney-Boonah road or Dwyer ridges road. Ah, my home town!! I'm living overseas at the moment so your pics have made me homesick! A shame the Mt Alford Store hasn't been restored yet – there was talk of new people taking it over but not yet. If it's alright could I add a wee plug? My mum, sister and brother are reopening the cafe on the Haig Park side of the dam (not the caravan park) in the next couple of weeks – keen for motorcyclists to drop in! I'm going to give this route a go this weekend. I'll be sure to provide an update (and a review of Renee's cafe if I stop in) on the conditions. Starting from Loganholme a little after 0630, the run out to Dinmore was a breeze with very light traffic. However, if you're navigating via GPS, you'll want to be careful going through Goodna with the roadworks that are happening through that stretch of the Ipswich Motorway. The roads were surprisingly easy going, offering ample opportunity to take in the scenery and the mountains as they began to grow ahead. I stopped at Kalbar for a coffee, and had a quick look around the old town as it was preparing for the day's Hay Festival. I don't have a GPS for my bike, and had opted to navigate via printed 'written' directions from a route I'd planned using the above post, and Google Maps. Unfortunately I'd misread the directions given and had planned a clockwise route around Moogerah Lake before hitting Aratula. However, I was frustrated to be greeted by dirt tracks at the southern end of the lake. After maybe half an hour of searching for a bitumen route, I decided to just continue on to Mt Alford, then through to Rathdowney. I took a quick detour to Croftby, but decided to turn back as I only had half a tank of fuel, and was unsure how far I'd have to travel to the next petrol station. I will, however, have to go out that way again as it looks like there are some stunning views out there. I stopped at Rathdowney for a quick bite to eat and a bottle of water before heading to Beaudesert for petrol. I managed this on my '09 CB400 and was very happy with the condition of the roads out that way (with the exception of a stretch between Maroon and the Mt Barney turnoff). As I said, the traffic was minimal, and I found the posted speed limits to be more than acceptable, often cruising well below the limit to take in the view. Great report. I too was unable to navi the lake all sealed. I don't mind riding dirt – just hate the bike getting so dusty. You can cut across from Mt Alford east but I don't think west from south of the lake. South of Rathdowney your fuel is at Woodenbong or Urbenville or Grevillia. I was wondering if you remembered the road that the old petrol station pumps were on? Thanks Elizabeth. They are on the road from Yamanto to Boonah.